But unless it can repeat that feat -- again and again and again -- this stock looks overpriced. Textron shares have recovered nicely from their initial sell-off this year. But should they have? TXT data by YCharts. Textron Inc. (NYSE:TXT), the maker of everything from Bell Helicopters, to Cessna business jets, to the new Scorpion "off-the-shelf" fighter aircraft, reported earnings on Wednesday. All in all the result were excellent - especially if you ask investors. On a generally positive day for the market at large, Textron stock raced ahead of the pack with a 4.9% gain. Even after giving back 0.9% Thursday (a red day for the stock market), the stock remains up 4% from pre-earnings. Q1 2016 revenues rose a modest 4% in comparison to Q1 2015, hitting $3.2 billion. Operating profit margins expanded by 30 basis points to 8.7%. That translated into operating profit growth roughly twice as great as revenue growth -- 8%. Reduced expenses then helped to grow the bottom line 17% to $150 million. And on a per-share basis, that worked out to 20% growth in profits -- $0.55 per share. Surprisingly, most of the revenue growth came not from Textron's marquis products but from the company's workaday industrial segment, responsible for manufacturing such mundane items as windshield washers, catalytic converters, and light transportation vehicles. There, revenues rose 9%, and profits 11%. But, really, the news was good all around, with both revenues and profits growing in all four of Textron's four key divisions. On the downside, manufacturing operations consumed $222 million during the quarter, and the company's total free cash flow was negative $236 million -- versus "only" $146 million in negative FCF a year ago. 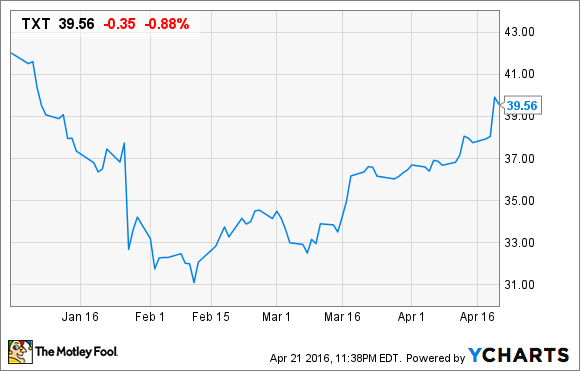 So what does all this mean for Textron stock? Based on trailing-12-month results, S&P Global Market Intelligence figures show that Textron has earned $719 million in GAAP profits and produced $532 million in positive free cash flow over the past year. Applied to the company's $13.5 billion enterprise value, that works out to a debt-adjusted P/E ratio of 18.8, and an EV/FCF ratio of 25.4. Given Textron's still negligible dividend yield and its projected long-term growth rate of less than 8%, I can only characterize TXT's current valuation as optimistic. But that optimism may not be justified. True, management told investors Wednesday that it expects to generate "solid" growth in revenue, earnings, and cash this year. True, Textron even put a number on the cash promise -- $600 million to $700 million, minus $60 million in "pension contributions" (and I would add, though Textron did not, minus capital spending, which has averaged more than $400 million a year over the past five years). But if that's the way things play out, I fear it portends even weaker free cash flow by year-end than what we've seen over these past 12 months. In short, it's my opinion that Textron stock is not worth as much as investors were paying for it last week. No matter how good Wednesday's news was, these shares are certainly not worth the high price they now fetch post-earnings.